Tracy remembers a formative moment when she was 15 and just starting to think about a future career. Her father, an attorney and lifelong Democratic Party official, took her to the United Nations for a program celebrating the 50th anniversary of the Universal Declaration of Human Rights. Eleanor Roosevelt had chaired the committee that drafted this declaration in response to the inhumanity of the Second World War. Tracy happens to be Eleanor’s great-granddaughter. The family legacy has always been important to Tracy, and it compelled her to pursue the issue of human rights in a life of service. If she were still alive today, Eleanor would undoubtedly have taken her great-granddaughter aside, instructing her—as she purportedly did with all the women in the family—to be involved in public life. Tracy hardly needs the encouragement. She heeded the ancestral call from the start. 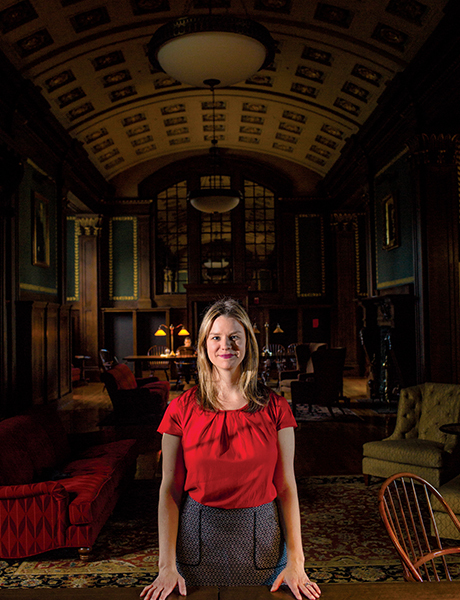 Fascinated by how the past informs the present—and determined to translate this interest into an active career— she majored in history in college and earned an MA in the history of international relations. Before pursuing her JD at Georgetown, she was a historical researcher in London for the library of former Nigerian president Olusegun Obasanjo, who recognized something special in Tracy. At the time, President Obasanjo was arbitrating peace in the Great Lakes region of Africa, and he told Tracy she had the gumption to be a peacemaker. She remembers this vote of confidence whenever things get tough. Now, working at an international law firm that handles conflict resolution and border disputes, she is sometimes the only woman in the room when meeting with clients or presenting to domestic courts and international tribunals. But she considers her presence vital. “It is critical for women to have a voice and a representative in the room where conflict resolution is happening,” Tracy says.